Often in life we come across people who leave a lasting impression on oneself and who inspire and influence a person by their passion and beliefs. I have been greatly inspired by numerous people in many different situations and at different times in my life. In 1978 I was in A Wing of Crumlin Road Gaol when I spotted these two individuals walking down the wing with a very dishevelled and abused appearance. One of these men was using a crutch and was obviously in a lot of pain. The other had a black eye and was very pale in complexion. One of these gentlemen had a Belfast accent, the other was a country man, or culchie, as the city-slicker Belfast men used to call them. Despite their appearance, they spoke to me in a very friendly and joking manner. “Have we missed dinner?” the man on the crutch asked. “Afraid so,” said I. “Ah, well, maybe that’s a good thing,” the other one said, just as the screw slammed the door behind them. The cell they were in was right next door to mine on A1. When these two were able to leave their cell for association or for meals they would spend most of their time inquiring after the welfare of their fellow prisoners, constantly trying to raise or maintain morale. They were so aware and so selfless. The man on the crutch was told that he didn’t have to line up in the daily POW parade, but he wouldn’t hear tell of it, and anyone who tried to talk him out of it was in for a real ear- bashing, to put it mildly. Both of these men are now dead and it hurts deeply when I think of these decent and remarkable human beings and the awful and obscene way in which they were dispensed of. They were in fact murdered because of political expediency, their lives of no value to the establishment and the warmongers of Britain. 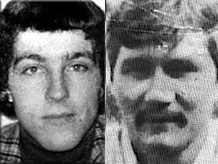 One of these men was gunned down in cold blood along with two of his comrades, no warning given, no chance to surrender. The man with the black eye, courtesy of Castlereagh, Dan McCann, didn’t stand a chance; neither did his comrades Sean Savage and Mairead Farrell. Francis Hughes, the man on the crutch, as a result of a gunshot wound obtained while engaging the SAS, disgracefully allowed to die on hunger strike in the H-Blocks of Long Kesh after 59 days without food. The interrogation centre, Castlereagh, was like a cattle market, as the flow of people passing through it, brutalised, and passed on to Crumlin Road Gaol, can testify. The ending of Special Category Status and the criminalisation policy introduced by Merlyn Rees was met with fierce resistance resulting in the blanket protest which started on September 15, 1976 by another extremely brave and inspirational figure, Ciaran Nugent. The war was being fought both inside and outside the prisons. Roy Mason, who succeeded Merlyn Rees as British Secretary of State, was a very tough individual who had a very tough background. Mason was a miner who started his life down the mines at the age of 14. With his working class background he was well aware of the discrimination and unfair system which is set against the working class. Mason, in fact, created the conditions and laid the groundwork for the arrival of Margaret Thatcher who willingly took up the cause of criminalisation with great vigour and arrogance, ultimately resulting in the deaths of the 10 hunger strikers. The British government gave the order for the murder of Dan McCann and his two friends. The British tried to spin the yarn that the three were all armed and had just planted a massive bomb. All of this lies! All of this from a government who ordered the deaths of 323 people in another conflict in another part of the world, these people serving on the General Belgrano, a ship which happened to be sailing away from the war zone during the conflict in the Malvinas, another colony of Britain. How difficult it must be to digest for the British establishment and their security chiefs, who would rather have buried the Irish and their stubborn republican politics in the depths of the ocean, just as they did the crew of the General Belgrano. How difficult it must be for them to concede that republicans are capable of achieving what the British always considered as unachievable. Unity in Ireland. The spirit of the Dan McCanns, the Francis Hugheses, the Ciaran Nugents and all the other republican activists of Ireland will win through. The proof is in the fact that numerous ex-POWs, including ex-hunger strikers and the unsung heroes, hard working activists, continue to push for change on the streets and in the corridors of what was once the holiest shrine of unionist dominance, Stormont. The whole situation has been turned on its head, transformed, and the real visionaries are those who fight our corner for a true democracy. The ultimate goal, an inclusive republic, can become a reality if the true progressives of Ireland forge alliances and work together.